- Aquatic plant guides for ferns and mosses, stem plants, rosette plants, and plants for the pond. Plants can be the main aquarium attraction or used to enhance your aquarium's beauty and health. - Plecostomus, Cory, Pangasius, Banjo Catfish, Upsidedown Catfish... See all types of catfish from thorny to armored, talking to walking, suckermouth, whiskered, flatnose and more! - Fish Guides for Barbs, Danios, Rasboras, Sharks, algae eaters, and more... popular tropical fish for beginning aquarist and experts alike. - Aquarium Eels, Fish Guides for all sorts of freshwater Eels, beauties like the Spiny Eels, Electric Eel, Fire Eel, American Eel, Spaghetti Eels, and more. - Fancy Goldfish, Fantail Goldfish, Commet Goldfish, Black Moor, Bubble Eye, Oranda, Shubunkin, Ryukin, Lionhead, and more. Great fish for beginners! - River Loaches are designed to cling to rocks in fast moving waters! The family Balitoridae favorites include the Batik, Chinese Loach, Rainbow Loach, Zipper Loach, and more. - Knifefish species, looks like a knife but swims like a fish! All sorts of knifefish beauties like the Clown Knifefish, Elegant Knifefish, Black Ghost Knifefish, Aba, Centipede, Featherfin and more. - Bettas and Gouramis are just some of the Labyrinth fish, Anabantoids also include Paradise Fish, Giant Gourami and more. - Mollies, Guppies, Platy fish, Swordtail fish, and Four-eyed Fish (Anableps). Great fish for beginners, easy to keep and breed! - Loaches are great aquarium scavengers and interesting fish too. Called thorny-eyes, loaches have spines right between the eyes! Popular species are Clown Loach, Kuhli Loach, Weather Loach or Dojo, Botia, and many more! - All types of Perches and Perch-like fish, fish guides forM ono or Moonfish, Glassfish, Archers, Scats, True Perches, Datnoids, Sunfish, Cardinalfish and more. - Pufferfish are chubby, personable tropical fish like the popular Green Spotted Puffer Fish, Golden Puffer, Fahaka Puffer, Amazon Puffer and more. They are also called Blowfish, Balloonfish and even Toadies! - Unusual Fish, the strangest to the most decorative tropical fish. Arowana's give a view of our ancient prehistoric, Butterflyfish delicate beauty, while Tonguefish, Lionfish and more are simply strange fish. Goldfish, how to feed your pet! How to feed your goldfish is one of the most important things you need to know! 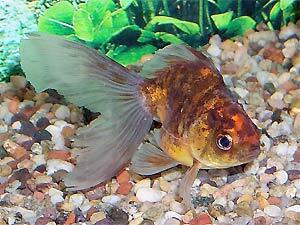 Pretty, lively, and very sociable, goldfish make wonderful pets and are great for beginners. They do have some particular care requirements, however, to keep them happy and healthy. Good care starts with the ri. . .